The TS-8200 is a TS-SOCKET baseboard that provides a development platform for Technologic Systems macrocontrollers. 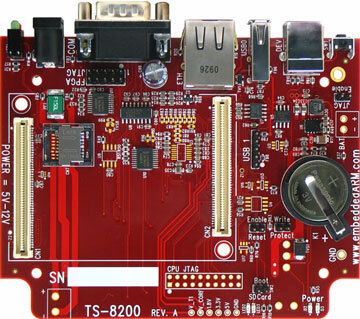 This board accepts any TS-4xxx macrocontroller, such as the TS-4500 or TS-4200. It interfaces to the macrocontroller via two TS-SOCKET standard 100-pin connectors and brings out the various ports to industry standard connectors. An inexpensive plastic enclosure is optionally available.